Today I discovered that one of the SI BSF8 stations (serial number 111515) on which I updated the firmware to 6.23 a few weeks ago was behaving strangely and that the voltage reported by SI Config was 1.64 V. With such a low voltage, the processor can hardly run and the beeper will probably not beep, at least not as loudly as it did. After booting to firmware 623, it can happen in rare cases that the device indicates a very low battery voltage. Config+ will show “(invalid)” for the battery voltage. This is a measurement error of the station. As a workaround, you should use the “Factory reset” command in Config+. This will reset the device and should fix the voltage value. I opened the unit up and found that the sleeve of the battery was cracked, but that there were no visible signs of corrosion or other problems, unlike in a previous station. The idle battery voltage was 3.46 V.
Sportident station 111515 with a cracked battery sleeve. I followed the recommendation in the release notes and used SI Config+ to do a factory reset of the station and after that the reported battery voltage was a much more realistic 3.17 V. A few minutes or so later the voltage was up to 3.25 V (a case of “voltage delay” in lithium thionyl chloride batteries). I hope the station stays in the sane state and that the Sportident developers soon figures out and solves this bug. I have previously written about how to interface an XBee ZigBee module to a FRDM-KL25Z board and also how to talk to an XBee ZigBee module from a Python program on a PC. In this article I build on these foundations and show how to make a somewhat more complex system where a Python program running on a PC sends commands to – and receives replies from – a sensor node. The sensor node has an SHT21 humidity (and temperature) sensor which is connected via I2C to the FRDM board. Here I use the API mode of the XBee module on the sensor node, instead of AT mode that I used in the previous blog post. There are a few XBee libraries for e.g. Arduino and mbed available. It might be possible to use one of those, but I looked into some of them briefly and it seemed like more work to understand and adapt one of those than to write the code necessary to take care of the somewhat limited communication with the XBee module required for this system. On the Python side, I continue to use the XBee library I used before. The XBee ZigBee modules need to be properly configured before they can be used in this system. The one connected to the PC shall be programmed with the ZigBee API-mode Coordinator firmware and the one used in the sensor node shall have the API-mode Router firmware. A 64-bit PAN ID must be selected and both modules should be configured with this. The combined humidity and temperature sensor I selected for this project is called SHT21 and is made by Sensirion. This is a reasonably priced nice little sensor (3×3 mm2) with I2C interface and a tolerance on the relative humidity of at most 3% (2% typical) between 20% and 80% RH while the temperature is accurate to 0.4 °C (0.3 °C typical) between 5 and 60 °C. A minor problem is that it comes in a 6-pad DFN-package (dual flat, no leads) with a pitch of 1 mm. I connected to the chip by soldering very thin wires (a single strand from a relatively thin multi-stranded wire) to the four pads that are used. I then soldered these wires to a small piece of prototype board and added a decoupling capacitor and I2C pull-up resistors (I happened to use 2.2 kΩ and 4.7 kΩ because I had them easily available in suitable form factors). The top side of the package needs to be away from the board to expose the opening of the sensor to the environment. This could potentially lead to short circuits between the board and the bare thin wires, but I put a piece of insulating tape under the sensor to prevent this. See photo below. SHT21 sensor (central black square) on a prototype board with a few auxiliary components. I ended up using the pins PTC11 (J1 pin 15, SDA1) and PTC10 (J1 pin 13, SCL1) as the I2C bus on the FRDM-KL25Z. I first tried A4 (J10 pin 10, SDA1) and A5 (J10 pin 12, SCL1), but it turned out that there is a square wave on A5 that obviously ruins the I2C communication. Maybe this could be turned off, but I moved to other pins instead of investigating what caused the square ware. The SHT21 has a bit of a quirky requirement on the I2C communication, namely that a delay of 20 µs is recommended between the ACK bit after some command and before issuing the stop condition. This turned out to be straightforward to implement using the mbed I2C library routines, see the file sht21.cpp. I did not implement a test of the checksum that the SHT21 provides. That can be added later and the easiest is probably to use code from the SHT21 sample code application note for this. 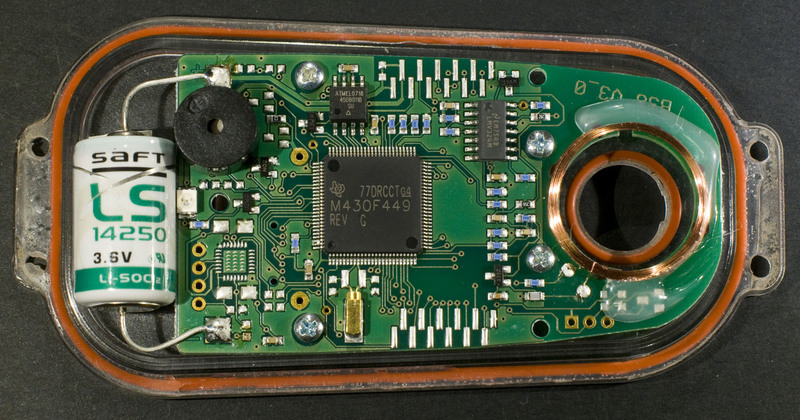 A photo of the complete sensor node prototype is shown below. ZigBee sensor node prototype based on a FRDM board, an XBee module and an SHT21 humidity sensor. To enable the PC to control the sensor node, some form of protocol needs to be devised on top of ZigBee that allows the PC to send requests to the sensor and also allows the sensor to respond. To send data between the two XBee modules, the “Transmit Request” API command is used. This allows messages containing about 80 bytes of payload data to be sent. At the receiving end the messages show up as “RX Packet” frames. This would mean that the relative humidity is 47.18%, the temperature is 24.11 °C, the RSSI is -57 dBm and that the error counter is at zero. This protocol can easily be expanded to more commands and different kinds of replies from different kinds of sensors. Examples of text printed in the terminal windows (Tera Term for the sensor node and IPython for the Python program) are shown below. Text printed from the Python program. Text printed from the sensor node to the USB serial port. 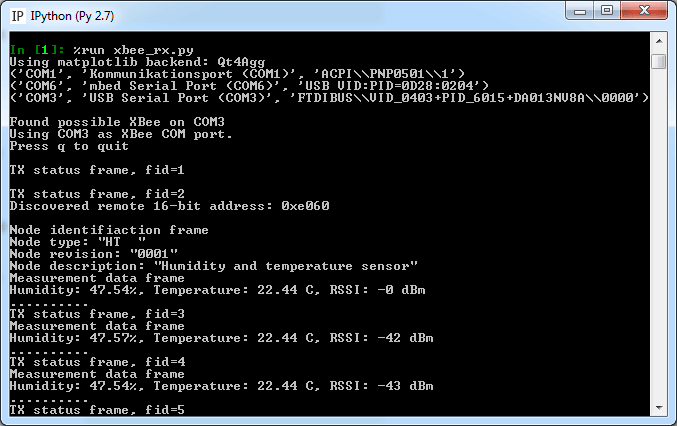 The Python code running on the PC starts out by selecting a COM port to use, sets up communication with the XBee module and sends an ID command to the sensor node before it enters into the main loop. The main loop regularly sends ME commands to the sensor. It also prints dots to show that it is running and checks if the q key has been hit, in which case it exits the program. There is also a function that is called in the background by the xbee library whenever a frame has been received from the XBee. This function takes the proper action based on what kind of frame was received. The information in replies to the ID and ME command are printed out. Also, if there is anything anomalous in the status replies to transmissions, a warning detailing the issue is printed. The 64-bit address of the sensor node is hard coded into the program (this might be OK for a quick demo or a one-off system, but should be solved in a more flexible manner in the future). The 16-bit address of the sensor node is not known at the beginning, but it is revealed in the first frame it sends back to the PC and so the Python program can store that address and use it in subsequent transmissions to decrease the burden on the ZigBee network. The Python code can be found below. This code is public domain and comes with absolutely no warranty. Enjoy! the data that comes back. print "Using " + portname + " as XBee COM port." print "Ignoring this port, using the first one that was found." print "Press q to quit"
# so make a press on the q-key exit the main loop. An interrupt routine receives the bytes coming from the XBee serial port and when it finds a valid frame, it stores it in an available frame buffer and marks that frame buffer as containing a frame to be processed. Currently the error counter functionality is not implemented. The individual files are described further below. and an SHT21 humidity/temperature sensor. // Not the expected frame type for this handler! // Send a response packet with the measurement data. This header file declares some global variables from main.cpp and typedefs a struct used for the data format in replies to the ME command. Declarations for the main part of the program. This file contains the interrupt routine rx_interrupt() which is called when data arrives from the XBee serial port. The data is parsed and if it is found to be a valid ZigBee frame, it is stored in a free frame buffer. The buffer is then marked as containing a valid frame to be processed (by the main loop). Frame buffers for data from the XBee module. and if it is found to be a valid ZigBee frame, it is stored in a free frame buffer. The buffer is then marked as containing a valid frame to be processed (by the main loop). // Interrupt routine to read frame data from the serial port into frame buffers. // Not a start delimiter. This is a bit unexpected. // Just eat it and wait for the next byte. // Got a start delimiter. // Find a buffer to store it in. // Ooops! The frame is bigger than the buffer, this is very unexpected. // We need to discard this frame. // so many bytes before starting to look for a new frame. // Start looking for start of a new frame immediately. 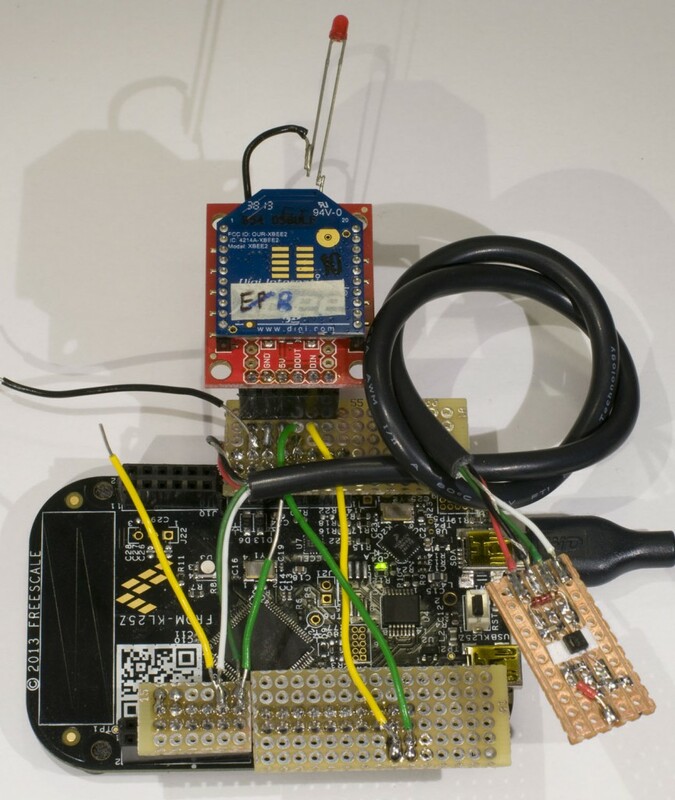 Functions to talk to an SHT21 humidity and temperature sensor via I2C. // Initialize the SHT21 sensor. Returns true on success. // Read the humidity from the SHT21. // The humidity is returned as a float (%RH). // Returns a large negative value if an error occured. // Read the temperature from the SHT21. // The temperature is returned as a float (degrees C). 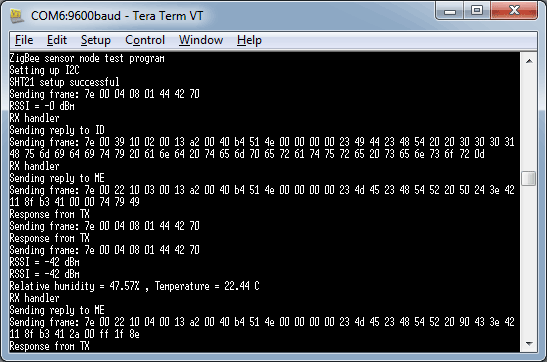 Header file for routines for SHT21 I2C humidity and temperature sensor. Functions to deal with the XBee ZigBee module. This includes functions to create and send various kinds of API frames as well as to get information out of received frames. Functions to deal with the XBee ZigBee module. // Calculate and set the checksum of the ZB buffer pointed to by buffer with the length len. // len is the number of bytes in the buffer, including start delimiter and length. uint8_t buffer[18+82]; // How much payload can there be? Header file with declarations and constants for ZigBee communication.